In colonial-era Boston, Octavian lives an unconventional life. His home is also the home of the Novanglian College of Lucidity, a group of philosophers and scientists who are providing Octavian with an excellent education even as they study his every move, right down to the movements of his bowels. His mother, once an African queen, is treated like the royalty she used to be, and Octavian is treated like a prince. But Octavian’s understanding of his life is built on a myth. Time, disease, financial ruin, and revolution all conspire to teach Octavian what his true situation is. This, the first of M.T. Anderson’s two Octavian novels, is both intimate, with its in-depth first-person account, and wide-ranging, with its references to classical music and literature as well as philosophy and the politics surrounding the American Revolution. It’s an ambitious book and, I believe, a successful one. The story is original and interesting, and raises ideas worth thinking about (even if they might not be entirely new to adult readers). I was fascinated by Octavian’s descriptions of his early life, which we only get from his child’s perspective. Readers coming to the book with the benefit of age and knowledge of past history will be able to understand many things that Octavian sees and takes note of but does not understand. 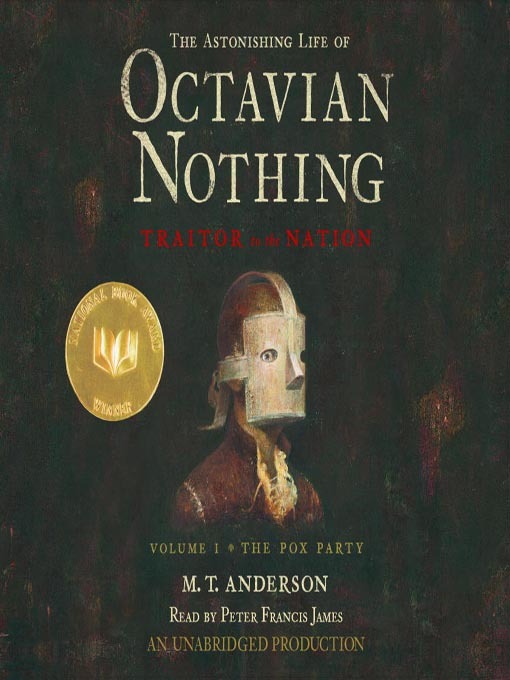 Anderson does a great job dribbling out the clues to Octavian’s true status without making Octavian seem unnaturally unaware or annoyingly dense. There are also some wonderful dialogues, such as the one between Octavian’s mother and the Englishman hoping to lure her to England with an offer of a luxurious flat along with his own “scepter and orbs” (wink, wink, nudge, nudge). And there are great set pieces, such as the pox party that closes the second half of the novel, in which a group of friends voluntarily get injected with smallpox in the hopes of experiencing a mild version in controlled circumstances and thus developing an immunity. Another aspect of the book that I found difficult was the section of letters in the middle, most of which were written by a Revolutionary War soldier. Anderson’s approach to this section of the story, when Octavian himself would have no access to journals or other means of communication, was a valid and interesting choice. I liked seeing Octavian’s presence become more and more significant as the letters went on. And again, Anderson does a nice job of revealing important information that the person doing the sharing doesn’t himself comprehend. However, I really didn’t care much about the troop movements and battles recounted in the letters, and my mind kept drifting. Also, after a while, the letters started to seem repetitive. In print, I might have minded the letters less (I usually adore an epistolary format), but on audio I couldn’t get a sense of the letters’ relative significance to the story. Knowing something as simple as how long a seemingly off-topic interlude might be can make a tremendous difference. As it was, I thought that the rest of the novel, starting just past the halfway point, might be made up of letters, and I got to worrying about the details and trying to get myself interested in the letter writer himself. This book may be shelved in the young adult section of your library or bookstore, but don’t let that fool you into thinking it’s unsophisticated or simplistic. This is really a complex story, and a well-told one. I do plan to listen to the next novel, only because I have it on hand on audio. I’m hoping that the interest I now have in Octavian’s story will help me get past the narration problems. If I find that it doesn’t, I may switch to print. This entry was posted in Audiobooks, Children's / YA Lit, Fiction, Historical Fiction. Bookmark the permalink. I’ve been seeing this at a children’s bookstore in town, and it always sounded interesting just from the title–so it’s good to see such an interesting premise to go with it. However, I’m a bit frightened off by the Volume 1 part of the title. Please tell me this is a complete novel rather than just Part 1? The novel does have a definitive end, but it’s somewhat open-ended. Not a cliffhanger, but a start of a new kind of life. I think the first could be read in isolation. I have recently delved into the world of audiobooks, and I am finding they can be tricky beasts indeed. Elements I would normally love in written books (like complex writing and longer sentences) can be too difficult to parse when read aloud, and certain elements just don’t translate well (like the epistolary format you mention). I am trying out Misery by Stephen King after your great review a few weeks back, but there is a portion early on where flashbacks are interspersed with present day and this was so confusing at first I thought there might have been a problem with the recording skipping! It is tricky! And sometimes it’s hard to know when the format is the problem. I’ve found too that some things that would drive me nuts in print are less of a problem on audio (overexplaining in so much popular fiction, for instance). Epistolary books can work well, but I think the key is separate narrators. In this case, it was one narrator, and he was completely new to the story. It didn’t translate well at all. I read the print version of this book and struggled with it! I can imagine it would be even more difficult to follow with the audio. I found the writing style very annoying so I’ll be interested to see if your thoughts on this series improves once you’ve switched to print. I’m actually giving the next book a try on audio because I had the audiobook on hand, but I’m thinking of getting a print copy to consult if it gets muddy. I found that I could follow the basic story okay, but I definitely missed some of the details! Interesting. I had assumed the audio format was the main problem, but based on what you and Jackie and Jill say, maybe not. I haven’t listened to many YA novels on audio, but I did enjoy the first couple of Harry Potter books several years ago. I can see how Gaiman would be great! I’m with Jackie and Frances and thank god I’m not alone! I didn’t like this book at all. I didn’t care for the language…and I didn’t think it worked as a YA book. Or an adult book, for that matter. I was trying to imagine younger readers’ reactions to this book, and I can’t imagine it appealing to many who aren’t already avid readers and who like a challenge. As you say, the language is tricky even for adults!